Produced by Grammy winner Tom Hambridge and featuring Walter Trout, Jason Ricci and Zach Zito, "Make Blues Not War" is very possibly Zito's most energetic album to date. "Its a fine combination of upbeat shuffles, slow grinds and personal experience. Combined, they make the strongest case for the genre being called ‘blues rock’ and not the other way around. The blues comes first on this release, as it should." - JD Nash, American Blues Scene. OPENER: JEREMIAH JOHNSON - 3X Top Ten Billboard Blues Artist and a Ruf Records recording artist Jeremiah Johnson currently hails out of St Louis MO, but has also lived and performed INHouston TX for 10 years of his career. 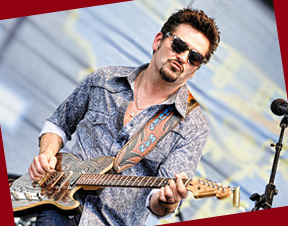 His debut Ruf Records release, "Straitjacket" debuted #1 on iTunes New Blues Releases, #6 on the Billboard Blues Album Chart, and has been in the Top 50 Blues Rock Album Charts for 29 weeks in the Roots Music Report.